I built my wort chiller four years ago. I purchased a 50' roll of soft 1/2" copper tubing and four 90 degree elbows for about $69.80 + $13.63 shipping. I then had to purchase soldering equipment (lead free solder and flux) and brass garden hose fittings. So I was probably in about $100 or so for my wort chiller build. When I got around to constructing it I only used about 40' of the tubing due to a height restriction on the vessel I was using to form the circular structure. 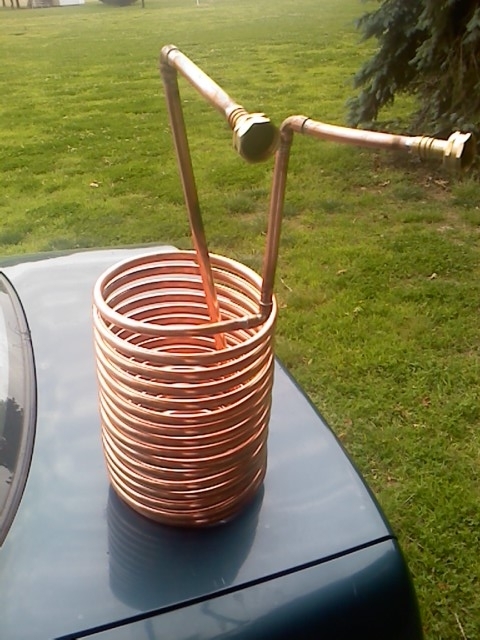 I still need to figure out what to do with the rest of that copper tubing! Fast forward to 2015, and I am kind of surprised to see that the prices of copper today are actually less than they were in 2010. In fact, the site I purchased my materials from even carries packages specifically for immersion chillers! For a while I thought my immersion chiller was just not as good as some of the commercial products out there. I would see products advertising 5 minutes to get to pitching temps… 5 minutes! I was immediately filled with envy as I recalled that last brutal brewday of the summer. You know, those 90 degree days where incessant stirring for 20+ minutes only gets you down to 78 F. I thought it was just my crummy chiller, but as with all things in my life I began to thoroughly research the issue at hand. I Googled for any information and product reviews I could find on wort chillers. I saw a lot of people with a similar dilemma give up on their immersion chiller and go with a counter-flow or plate chiller. I was also aware of Jamil Zainasheff's recirculating whirlpool system. All of these seemed like wonderful options. Unfortunately, they too, all seemed to have flaws. The biggest of these flaws to me was that a pump was required (I don’t own a pump). I kept researching and was really intrigued by the JaDeD Brewing chillers. Their chillers post some crazy fast chill times with the Hydra boasting a 3 min chill to 68*. Okay, this is some sort of brewing magic, right? Do you need to sprinkle special chilling dust at flameout to achieve these results? The answer: Nope! JaDeD provides insight to this sorcery by explaining the science behind fast cooling. To paraphrase, it is essentially the input chilling water flow rate and wort movement which dictates how fast you can chill. Yes, the temperature of your source water can make a big difference, but that wasn't the component I was lacking. I have always had good wort movement - I stir the heck out of it as I am chilling. However, I, for some silly reason thought if I turned my spigot on only halfway or even a trickle, that I would somehow be extracting the most heat possible from the liquid? Not sure how I came up with that inaccurate idea. Maybe, I figured running the water through too fast wouldn’t fully utilize that volume of water's potential? Or maybe I was just drunk. Either way, I now feel like such a bonehead. Keeping cool water flowing through your immersion chiller REAL fast and keeping the wort moving (to avoid hot and cold spaces) is what results in fast chilling. The next brewday when it came time to chill, I opened up that spigot full bore and “let 'er rip.” Boy was I surprised to be within 10* of my groundwater temperature within 5.5 minutes. Now I don’t feel so insecure about my immersion chiller, and I can get back to brewing some great beer. I invite you to learn from my mistakes and make the most of your wort chiller - if it aint broke don’t fix it! How do YOU chill your wort and why? Let me know in the comments below! After writing I remembered reading a post on Brulosophy a while back where Marshall tested using a pump to recirculate vs his (and my method) of moving the chiller all around. Spoiler alert, manual beats mechanical.